Son of Joseph Ḥanoks, a Talmudist and cabalistic writer, one of the refugees who, at the expulsion of the Jews from Vienna in 1670, went to Bavaria, to promote Talmudical learning among their brethren in their new home. Being thus reduced in circumstances he at first had to wander from town to town through Bohemia and parts of Germany as a teacher, highly reputed for his Talmudic and cabalistic knowledge as well as for his eloquence as a preacher. As the son-in-law of Veitel Isserles, rabbi of Kremsier, nephew of Gerson Ashkenazi and David ben Isserles in Trebitsch, a relative of Aaron Teomim of Worms and Menahem Mendel Bacharach in Bamberg, he was received everywhere with open arms. 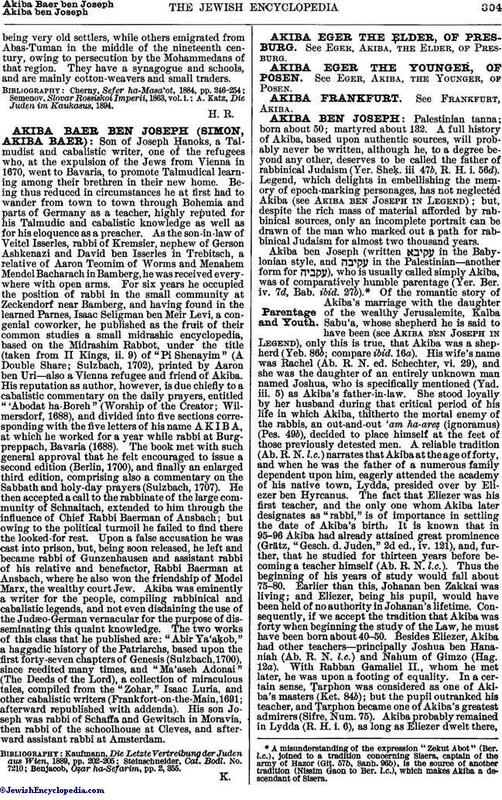 For six years he occupied the position of rabbi in the small community at Zeckendorf near Bamberg, and having found in the learned Parnes, Isaac Seligman ben Meir Levi, a congenial coworker, he published as the fruit of their common studies a small midrashic encyclopedia, based on the Midrashim Rabbot, under the title (taken from II Kings, ii. 9) of "Pi Shenayim" (A Double Share; Sulzbach, 1702), printed by Aaron ben Uri—also a Vienna refugee and friend of Akiba. His reputation as author, however, is due chiefly to a cabalistic commentary on the daily prayers, entitled "'Abodat ha-Boreh" (Worship of the Creator; Wilmersdorf, 1688), and divided into five sections corresponding with the five letters of his name A K I B A, at which he worked for a year while rabbi at Burgpreppach, Bavaria (1688). The book met with such general approval that he felt encouraged to issue a second edition (Berlin, 1700), and finally an enlarged third edition, comprising also a commentary on the Sabbath and holy-day prayers (Sulzbach, 1707). He then accepted a call to the rabbinate of the large community of Schnaitach, extended to him through the influence of Chief Rabbi Baerman of Ansbach; but owing to the political turmoil he failed to find there the looked-for rest. Upon a false accusation he was cast into prison, but, being soon released, he left and became rabbi of Gunzenhausen and assistant rabbi of his relative and benefactor, Rabbi Baerman at Ansbach, where he also won the friendship of Model Marx, the wealthy court Jew. Akiba was eminently a writer for the people, compiling rabbinical and cabalistic legends, and not even disdaining the use of the Judæo-German vernacular for the purpose of disseminating this quaint knowledge. The two works of this class that he published are: "Abir Ya'aḲob," a haggadic history of the Patriarchs, based upon the first forty-seven chapters of Genesis (Sulzbach, 1700), since reedited many times, and "Ma'aseh Adonai" (The Deeds of the Lord), a collection of miraculous tales, compiled from the "Zohar," Isaac Luria, and other cabalistic writers (Frankfort-on-the-Main, 1691; afterward republished with addenda). His son Joseph was rabbi of Schaffa and Gewitsch in Moravia, then rabbi of the schoolhouse at Cleves, and afterward assistant rabbi at Amsterdam. Benjacob, Oẓar ha-Sefarim, pp. 2, 355.